In the spirit of what Rotary International President, Gary Huang, intended, the Rotary Clubs of Tempe (Downtown, Kyrene, Rio Salado, and South) with ASU Rotaract held their first annual Rotary Day at the SRP Pera Club on Saturday, March 14, 2015. 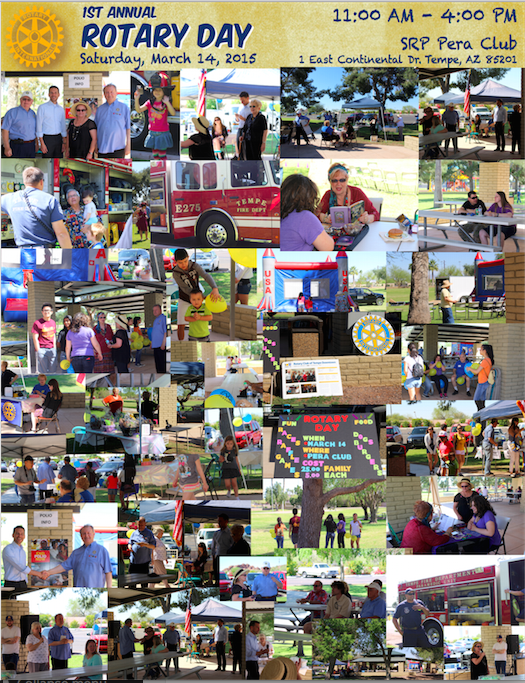 The event was a great opportunity for Rotarians and their friends and families to spend a day of fun and relaxation, but at the same time learn more about the Clubs in Tempe, their activities, and about Rotary in general. The event was a team effort, and showed how the clubs can work today to promote Rotary in the local community. Special guests included Tempe City Councilmember Kolby Granville, District Governor John Pennypacker, and District Governor Elect Sherry Mischel. The Tempe Fire Department brought a fire truck, which was a great hit for both young and old. The kids were able to jump up and down in the bounce house, while their parents and friends relaxed in the afternoon sun. Another major highlight was Madame Feder, the fortune teller, who brought nothing but good news to the participants. Hamburgers and hot dogs were served by the Rotary Culinary Chefs, while everybody listened to hits from several decades. There were many games to play, while enjoying the scenery surrounding the beautiful Pera Club. Thanks to Randy Clawson for organizing, and the many Rotarians across the Tempe Clubs and ASU Rotaract for helping plan and execute the event. This entry was posted in Events on March 15, 2015 by downtown.